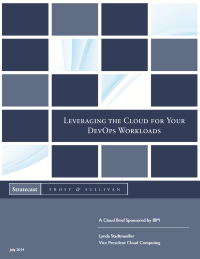 Download this report and explore how by choosing the right PaaS, an IT organization can align development and operations resources, ensuring that applications are deployed quickly, cost-effectively, and error-free. Enterprises are finding that Platform as a Service (PaaS) is more than a toolset for developers and Infrastructure as a Service (IaaS) can be more than a place to host apps. Instead, IT departments can use the cloud to redefine the continuum of development and operations—a process that is known as DevOps.